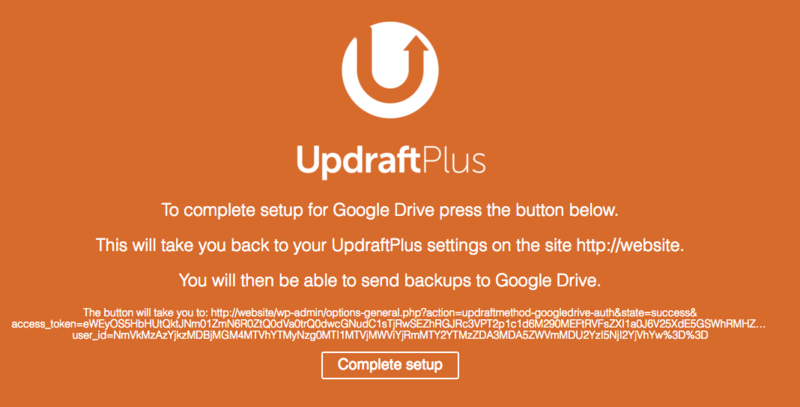 As of UpdraftPlus free version 1.13.6 and premium version 2.13.6 we now have an offical UpdraftPlus Google Drive app. This makes setting up Google Drive for remote backups easy.If you don’t want to use our Google Drive app and prefer to setup your own then follow the instructions here. To setup Google Drive using our app on a new WordPress install simply click the Google Drive option as a remote storage option and then save your settings. Note: if this is on an existing install with Google Drive already setup then you will want to clear your saved Google Drive settings, the easiest way to do this is to use the link in your Google Drive settings. After you have saved you should be promted to press a link to complete your authorisation. Follow the link and you should be asked to choose your Google Account/Signin to your Google Account and then be asked to grant permission to the UpdraftPlus app once you press allow you should be taken to the following screen. Here you just simply need to press the complete setup button and you will be taken back to your WordPress website. You should now be authorised with Google Drive and can now backup your WordPress install.